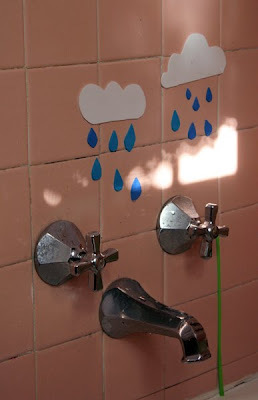 If you've been with us for a really long time then you might remember these outside paper and water murals from when the kids were quite little. 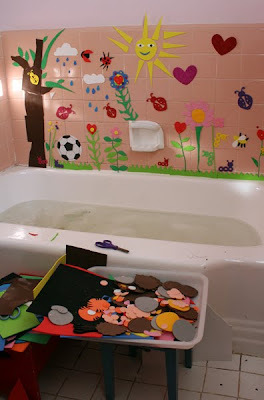 This craft foam bath mural project works on the same principal. Just surface tension, which is great, because it means everything is able to be used again and again. 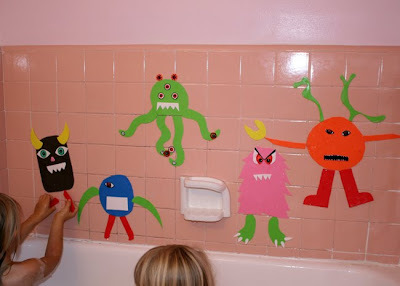 We don't have many bath toys, but this activity has shown no signs of getting old, because there are endless creative possibilities! 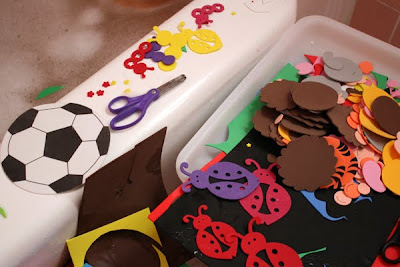 I'm quite lucky in that whenever my friends get kid's craft kits that involve craft foam, they always give me the left overs :) My house has become the repository of unwanted random bits of craft foam and that's really handy for bath time! 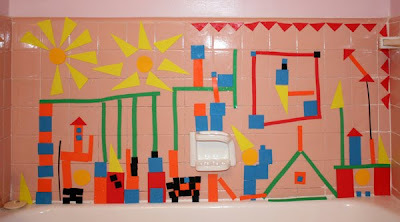 I know you can buy chunky foam bath "stickers" that adhere to the tiled walls or side of the tub with just water due to surface tension, but they are pretty limiting in that they are all pre printed themed pieces, so there's no creating for the kids beyond imaginative play with the set they have. What you want is a load of brightly coloured regular craft foam. Not the self adhesive backed stuff, just the cheaper plain old stuff. The Dollar Tree often does decent sized packs with a few colours in and really, the cheap thin stuff is the best because it's easier for the kids to cut and is lighter, so the surface tension keeps it where they put it for longer. If I leave the mural up after their bath in the evening then only about half of it has dried to the point where it falls off into the tub by the morning! Other times I use up random left overs like the insects and flowers for the garden set. The kids like to be able to cut their own pieces too. The only rule is that if you're holding the kid scissors then you're sitting down. 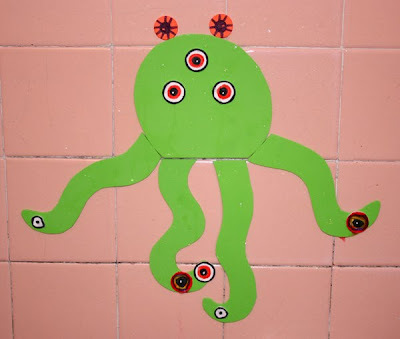 Some of the pieces like the monster eyes are drawn on with sharpie pen and they hold up pretty well to getting wet. If you have any of those shaped punches meant for scrap booking then you can get a load of good shapes quickly from those. I only have a punch for making rounded corners, so we just hand cut stuff with the children's safety scissors. We've also got a set based on the Duplo word blocks from a while back. For younger kids the alphabet might be popular with lower case on one side and upper case on the other? You don't even have to be having a bath at all, you can just give them a bucket of water to dunk the shapes in and they can stand in the tub with it cutting shapes themselves. The kids think it's really funny to be sitting in a tub of craft foam soup, and it's easy to clear up. I just store the sets under the sink in the bathroom in ziplock bags (I don't close them though, because I guess they might get funky if they were still a bit wet and sealed shut?) Because the foam floats, you just need to scoop all the little bits off the surface of the water before taking the plug out so you don't have them escaping down your plug hole and blocking the drain. There are loads of possibilities with this, even for older kids. They could make board games to play on the sides of the tub, or their own poetry set like the magnetic fridge ones you can buy. My youngest daughter up until she was two years old would have just tried biting chunks out of the pieces though, so I guess there's a lower age limit to this unless you can find really thick craft foam to cut yourself. Some of the themes we'll be going for in the future are things like numbers so we can practise addition and subtraction, along with circles for counters. I think my girls would really enjoy having all the internal body parts cut out with name labels to construct the human body too. Paul suggested robot parts, which I think they would LOVE! Cut out country shapes to fit together a world map? State shapes for a US map if you're American? Tangrams? sections to build wiggly tracks around the inside of the tub that you can drive your toy cars around on like one of those vertical wheels of death? You're only limited by your own imagination with this! I am totally going off to do this right now. I have 2 sick kids today and this will be perfect when they wake up. This is so much fun! Craft foam is one of the things I miss here. Modpodge being another. Sigh. I love the city on a planet mural - fantastic imaginations. Your home made foam shape collection is awesome, it puts our store bought road set to shame. I will now be looking out for craft foam. Not sure how I feel about scissors in the bath though. Great ideas. 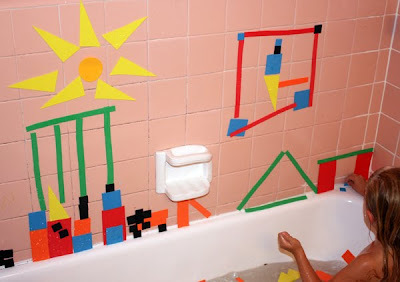 We've done this with shapes in the bath building pictures like wooden blocks. When the kids started coming in the shower we moved them in there which also works a treat. Outside you can have a tub of water next to a glass door or window. Also I agree on the tangram idea which even works for adults in the shower. 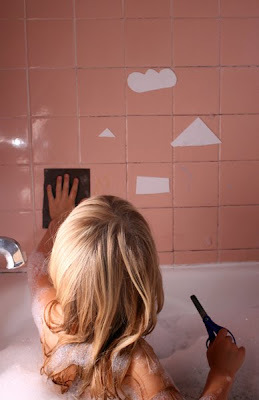 Laminating a chart of tangram pictures and sticking it on the shower screen gives you heaps of ideas to try. 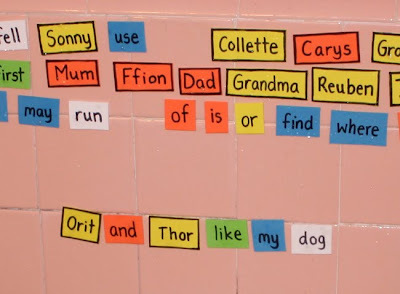 A friend just put me onto your blog love the duplo letters too. That's such a wonderfully creative idea! 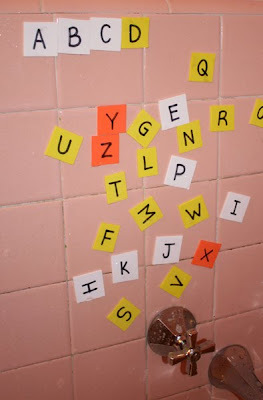 We had a bucket of pre-made foam letters for my son to play with in the bath, but I never thought of making my own. Very cool! I've said it before, but your girls are seriously lucky to have you as their mum! My oldest daughter used to bite foam, too, and because of that we've never had it around much. But I don't think my current baby would, so we should really give it a go! This is an awesome idea! I'm thinking it might work on a whiteboard too.... with the bucket of water for dipping... We're off to try! Thanks for sharing! What an AWESOME idea! Once my 5 month old gets bigger, we'll definitely have to implement this idea. What an awesome idea! I'll definitely keep this one in mind when I have kids! Can I use one of your pictures for my reading blog? I realized that I used one for the Duplo word blocks and hadn't asked first. Let me know and I'll take it down if needed. You have the best ideas for little kids. We're trying this out tonight! This is simply brilliant! I am going to make a bunch of these. My boys are going to flip!! What a fantastic idea!! I am totally putting foam on my buy list! Thanks! I went and bought foam today (yay dollar store) and I"ll be starting at LEAST two sets. One is still up for decision, the other will be a Mr. Potato head. How cute will THAT be!! I think this is now the tenth comment I've left saying the same thing, but you're a genius! I realized one thing I love about your projects is the fact that you REALLY carry them through. If this were me, I'd have made 5-10 foam shapes and called it a day. You make 5,000. Nice Lindsey! They look like they're having a blast. I remember as a boy having some sort of bathtub crayons for drawing on the walls, but this looks like a lot less work at clean-up time. I love that ! Thank you for this great idea. WOW this is reallyyyyyy brilliant!!!!!!!!!! It can really extend children creativity to the maximum! Thank you so much for sharing. 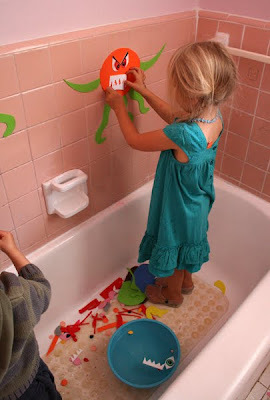 Okay, I am totally totally putting some foam shapes in my daughter's bathtub. She thinks whenever anyone in the house is bathing that she has to be too! Love this one, too. You are inspiration to me and many other moms (and some dads, too)! You could use a hole punch and make a few holes in the ziploc bags, so they can still dry out, even when closed shut. What a super idea! When I read your post I was wondering how you kept the scraps from going down the drain? Do you have some trick? Ok I just found this and cut up some pieces for the kids. They have been in the tub for 45 minutes and do not want to get out. This is a brilliant idea and really one of those "Duh that makes so much sense ideas". I will be blogging about this one! This is such a neat idea. I love how endless so much of what you do is. Thanks for the great idea. I simply love you - what a fabulous mama/inspiration for mamas you are. Now that is awesome! 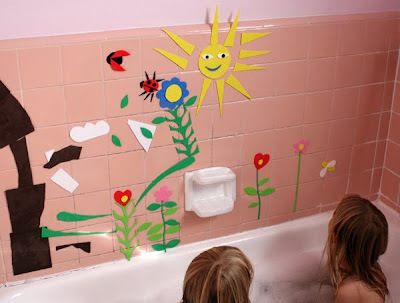 What a great way to get all those reluctant children into the bath ... They must however look like shriveled prunes by the time you get them out I'lI bet! 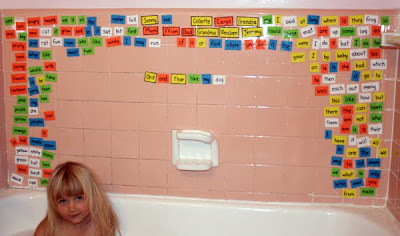 I can only imagine where Diane would have gone with this bath time creative goodness. Sometimes i feel like being a mother in the 70's I missed all the good stuff! What a cool idea! I just saw a set of these that were precut at Target. I didn't stop to check the price, since I already had read your post, but I can guarantee they were way more expensive and less creative. I love your blog BTW and I have a blog award for you! It's posted at http://www.homeschoolmo.com/2010/09/my-first-blog-award.html. I absolutely ADORE this idea! 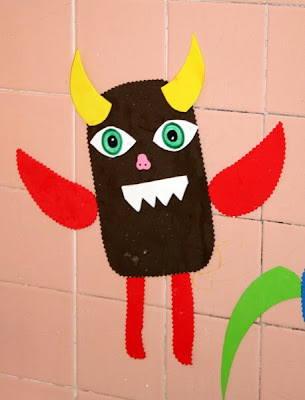 I love crafts that provide children with truly endless possibilities. Not to mention how easy and cheap it is. Great job! this is brilliant! thanks so much for sharing! This is such a wonderful idea. It inspired me to make some craft foam sea creatures for my son to help him learn colors. Thanks for the idea! I linked your blog to my post. 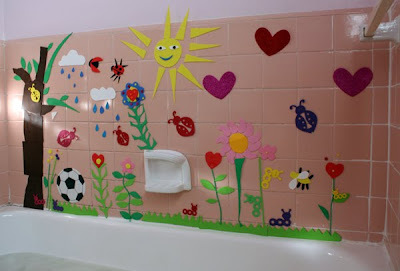 This is like Colorforms for the bathtub. These are awesome! Thank you for posting them, what a great idea. We made a handful and I plan on making more to go in my daughter's stocking. Plus sets for the kids on our christmas list :D I'm sure they will all love love love them as much as my daughter does :) You can check ours out here if you care to! Love these-just finished a set last night for my little lady. I'm thinking a small mesh laundry bag would be great for storing them while allowing them to dry. Thank you so much for the great idea! I made a set last night for my girl in which I discovered that if I pressed cookie cutters into the foam it would hold the shape of the imprint long enough to cut around. I guess if I had metal cookie cutters then it might even punch through and cut out the shape without much effort. I only have plastic ones though but they worked to leave an imprint. We now have a really brilliant zoo themed craft foam set for the tub because most of my cookie cutters are animal shapes. There are a couple of Santas and Christmas trees in the zoo too but she doesn't mind. :) Now she loves to have a bath! I just featured this awesome project at UCreate with Kids. wonderful, thanks for the idea!! Hi, I am wondering...do they get moldy, etc? How do you store them/dry them out between baths? Would love to know! hello, someone had directed me to your fun post. 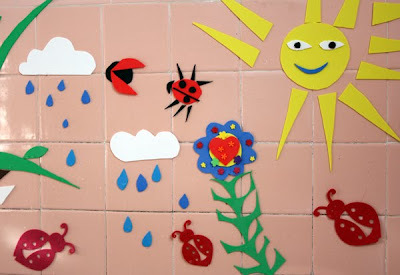 I blog over at www.mamamiasheart2heart.com and I do a fun foam/felt Friday ever week. I was going to do a round up post of foam/felt projects in the blosphere and someone directed me here...was wondering if I could include this on my round up. Thanks so much. Things and stuff and you lot.